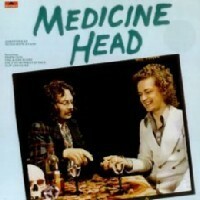 Medicine Head were a duo and then a band that came to fame in the early 1970s when they were signed to John Peel's Dandelion label. They stood out as different. Like so many brilliant singer-songwriters and bands of the late '60s and later, I discovered Medicine Head on the late great John Peel's BBC R1 show Top Gear. They had a really distinctive sound and were not surprisingly signed to Peel's Dandelion label. Made up originally of John Fiddler on vocals, guitar and drums and Peter Hope-Evans on harmonica, Jew's harp and mouthbow they managed to make a really big sound from just the two musicians. Peter Hope-Evans had a mass of big hair that contrasted with John Fiddler's long locks and moustache. Whilst John did the vocals, guitar and percussion with cymbals and a bass drum in the style of a one-man band, Peter played the twanging Jew's harp or bluesy harmonica and they rocked! 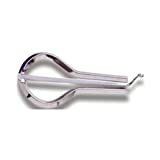 Of course I had to get a Jew's harp and eventually mastered the strange instrument. There is a real skill to it because if you don't hold it just so you cannot get the right sound. You need to hold the main part of it firmly against your teeth whilst twanging the spring part in the gap between. Over the years I got several different Jew's harps and played one on the recording of my own song Superhero. Medicine Head had started off as a real underground act but at last they had their first commercial hit with (And The) Pictures in the Sky, which reached number 22 in 1971. I loved the lyrics of the chorus-line: "And the pictures in the sky helped my soul get high." You only have to look at a beautiful sunset or a formation of clouds to understand these words. Other hits that followed were One and One is One that got to number 3 in 1973, Rising Sun that reached number 11 in1973, and Slip and Slide that got as high as 22 in 1974. I was, and still am, a huge fan of Bridget St John too, and she was also on Peel's Dandelion label. I saw Medicine Head live several times at the Student's Union in Cardiff and even ended up dancing on stage with them. They had several songs they used to really rock out in and Peter Hope-Evans used to do amazing blues-harp playing over John Fiddler's guitar and bass drum. Later stages of Medicine Head saw a full rock band but for me personally they were at their best as a duo. Watch videos & listen free to Medicine Head: One And One Is One, Rising Sun & more, plus 3 pictures. Medicine Head formed in Stafford in 1968, and came to prominence when championed by influential DJ John Peel. Imagine my surprise when just the other year I got an add friend request at Myspace from none other than John Fiddler. Of course, I added him straight away and sent him a message saying I saw the band years back and had danced on stage as they played at the Cardiff Student's Union. Medicine Head finally broke up in 1977, but whilst the band was no more they lived on for me in their brilliant music, and because so many times when I am admiring the magic of an incredible sky I think of their first hit record. Thank YOU for your comments and knowing and enjoying this brilliant band! I remember them well from my misspent youth. "One and one" is still one of the favorites and it was good to hear it again. Thanks for a great page on a great little band! Welsh Wizard is an album of original songs by Bard of Ely and released on the DMMG Records label. In 1965 the Supremes were a sensation. I was only eleven years old but here's my personal encounter with the three stars.